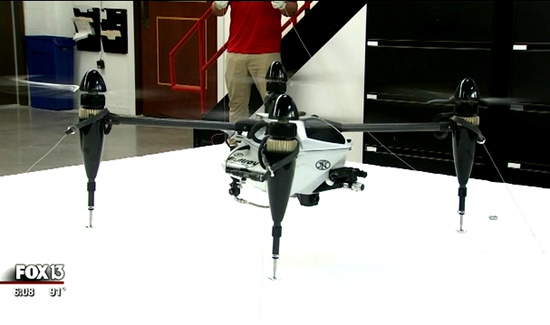 TAMPA (FOX 13) – A company called Rapid Composites in Sarasota has developed a prototype drone that can be outfitted with weapons by the military or equipped with a near-lethal weapon for law enforcement use. “For a bad guy running through the woods, for law enforcement, it basically makes their job safer,” says Alan Taylor, Rapid’s CEO. He says officers can communicate and negotiate with a suspect through the drone’s 2-way communications system, or, if the situation warrants, incapacitate the suspect with an onboard, air-powered launcher that fires a non-lethal round filled with pink dye. “One round typically breaks a rib when it’s a chest shot, so it typically ends the altercation right then and there,” says Taylor. It’s fully amphibious, says Taylor, so it can be used for anti-piracy and coast protection missions. He says the four-engine craft can fly at 100 mph and lift more than 35 pounds in additional payload. Taylor estimates the law enforcement version will sell for around $150,000. Taylor and his team demonstrated the Bullray for FOX 13 with tethered flights inside its Sarasota headquarters. Taylor says untethered testing will begin when FAA certifications are obtained.